I bought some awful coffee while I was on a long walk with the dog. I talked to the boss about taking a day off, but he thought I ought to come to the office. I saw that famous Australian author last autumn at the writer’s ball. My daughter caught a fish at the break of dawn. Did you try the awesome pasta with sausage and tomato sauce at that restaurant? 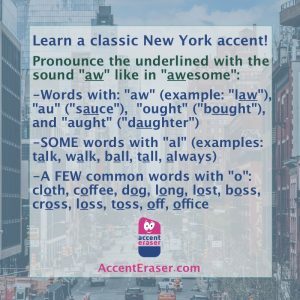 Want to perfect your New York accent? Contact us about accent training and dialect coaching!